Less than 24 hours until the 2012 Home & Garden Expo begins! Trompe Loeil is on the all-mesh region of Dreamseeker Expo 4 and we have a ton of new items exclusively for the year’s biggest home goods event, but first we’d like to show you our two donation items – 100% of the price goes to Relay For Life. 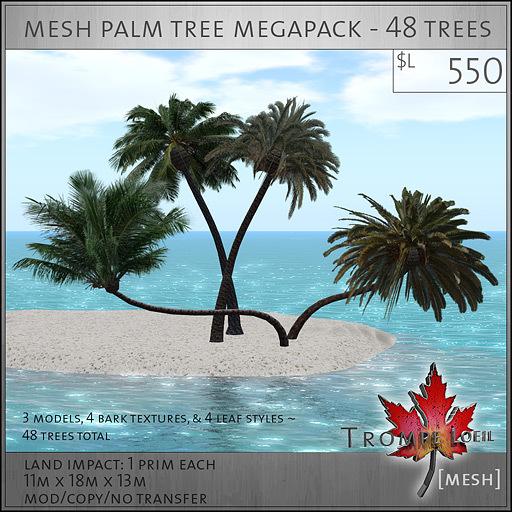 Our first donation item is a huge mod/copy megapack of brand new mesh palm trees! 3 styles, 4 bark colors and 4 palm leaf types are included for a total of 48 unique trees – and they’re only 1 prim each! 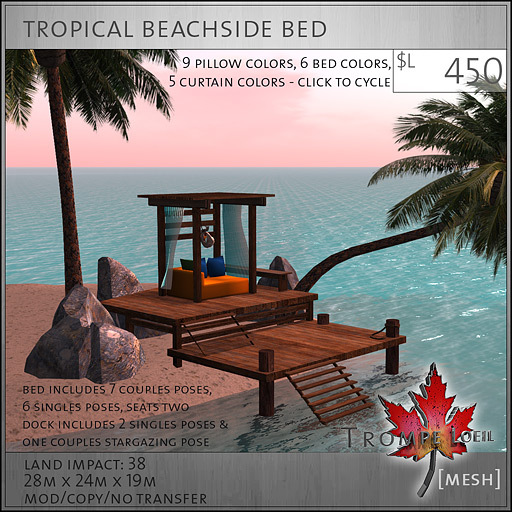 Our second donation item is the Tropical Beachfront Bed – a 38 prim instant setup perfect for your lake or beachfront property, it includes two palm trees and three decorative rocks already in place. The two-story deck includes stairs that lead up from the sand and down into the water, 3 deck animations (seats two – includes couples stargazing!) and a beautiful sheltered bed with pillows (all texture change on touch – 9 pillow options and 6 bed options) and softly blowing curtains (5 textures available on touch) that includes 7 couples poses and 6 individual poses, seats two. These items are only available at the Home & Garden Expo and all proceeds go to Relay For Life, so stop in at the all-mesh Dreamseeker Expo 4 as soon as the gates open to grab yours! Coming next: Trompe Loeil has even more exclusive items for the Expo and we’ll be featuring them tomorrow just in time for opening day – see you there!